The EVOLV Industrial “W” Series boiler is designed for hot water heating applications with a maximum allowable working pressure (MWAP) of 160 psig and a maximum allowable working temperature (MWAT) of 250 F in accordance with Section IV of the ASME Code. The boiler design may be supplied in two versions, one using a mechanical interference tube to drum connection and the other with welded tube to drum connections. The interference connection version offers advantages when considering boiler maintenance in the event a tube were to need replacement within the pressure vessel. With this type of connection, tube replacement may be effected without the need for any torch cutting or ASME welding on the vessel. An additional significant design feature of the EVOLV Industrial boiler is the heavy gauge reinforced steel casing with its’ bolt together design. Full access to the boiler fireside is achieved requiring only standard hand tools. With its’ innovative pressure vessel and tube configuration, the boiler tubes form membrane waterwall surfaces in both the radiant zone (furnace) and convection zone of the boiler. Tubes are arranged tangentially to form the membrane waterwalls without the need to weld adjacent tubes together, thus facilitating fireside maintenance for cleaning and / or tube replacement. Another key to the EVOLV Industrial boiler pressure vessel design is the creation of five full length longitudinal gas passes which produce a greatly increased gas side heat transfer coefficient (hg) resulting in higher overall heat transfer coefficients (U) for the EVOLV heat exchanger design. As a result, the EVOLV Industrial “W” Series boiler operates at the highest available efficiency in the Water Tube Boiler market. Standard efficiency without the use of an economizer has been field measured at 85%. This combined with the heavily insulated casing / jacket design, with radiant heat losses of less than 0.5%, results in a very significant reduction in energy consumption and thus greatly increased fuel cost savings. Combining this with the capability of operating the boiler from a cold start without concern for damages caused by thermal expansion and contraction offers the consulting engineer improved system design flexibility which will allow for additional savings with ancillary equipment and system piping requirements. EVOLV Industrial “W” Series hot water boilers, the best choice for your central hot water heating plant requirements. 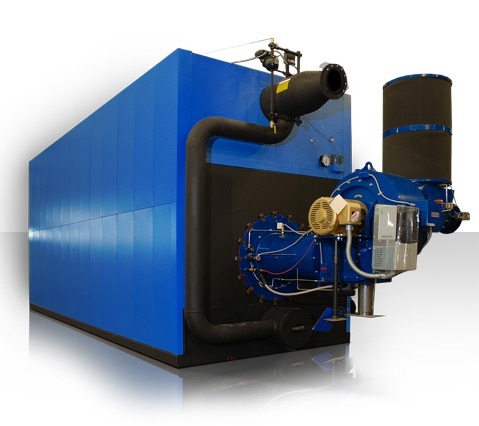 Steam, Water, and High Temperature hot water boilers from 800 to 1600 HP and pressures up to 800 psig MAWP. Rapid start-up of just 13 minutes from cold start.